Its a pie! It’s a cake! It’s a cake pie! It’s been a while since I brought a pie to work, so I thought this would be the week. I never know when my co-workers are going to be hungry. Sometimes they are ravenous in the morning because they haven’t had breakfast (or more often, they’re hungover). Sometimes they want a lunch supplement. Most often they need an afternoon pick-me-up. Being that this pie is mostly cake, I thought it could bridge the meal gap nicely for any time of day. 1) Don’t forget to use a 9 inch pie pan for this instead of a 9 1/2 inch. Also, the recipe calls for a pan with a lip, but I don’t think that’s necessary. 2) The recipe says to crimp the edges of the pie crust, sealing in the cake batter below. What does that even mean!? 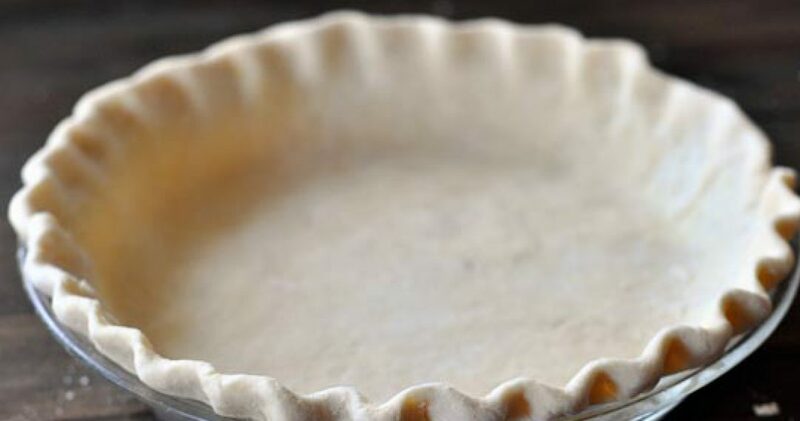 How does one simultaneously seal a top crust and then lift to crimp the edges upward? And why? The pie is being flipped upside down when it’s done. You can’t even really see the crust! Rant over. If I’m being honest, I didn’t taste this one because I am doing Whole 30 yet again (hi, post-holiday diet), but I am told it was good, yet unnecessary. There didn’t seem to be a true need for a pie crust to be added to a cake. If the filling had been creamy or custardy, then the crust would have made total sense. One of my favourite things in the world to eat is pineapple. Thanks for this wonderful recipe!